As has been shown, ever since the Europeans encountered the aboriginals, many Europeans and Euro-North Americans have been fascinated by the aboriginals and often taken on their roles in various ways in order to deal with the problems they saw n their own society. Then, in the 1970s, a new format granted even more people a framework to play with aboriginal identity: the role-playing games. In such a game, a group of friends seated around a table can explore a fantasy world peopled with all sorts of strange creatures and cultures while a set of rules, usually accompanied by dice, is used to show if someone succeeds at a particular action, such as whether a player character wins in a fight against a dragon or whether a player character is able to successfully scale a wall. Role-playing games are an opportunity for people of all ages to play-out particular fantasies and yearnings, to take-on idealized identities different from their own, just like the people dressing-up in feathers at the powwows or adopting aboriginal names as part of secret societies. Many of the players of role-playing games are normally shy, introverted individuals who have a hard time interacting socially in most environments, and are drawn to role-playing games because these present a fantasy environment in which they can more easily express themselves. If such games as Dungeons & Dragons had been around when Grey Owl was a child, it is likely that he would have become engrossed in them, for he spent a lot of his childhood, and of course adulthood, adopting roles of his own, as “young Archie… sought refuge in a warm, friendly fantasy world.” In role-playing games, players battle monsters, perform magic, save the world, do all the things they could not in the real world, and through that “players are imbued with a sense of power and control over their lives that they may feel is lacking in reality.” Though this exploration of identity, a person can explore parts of themselves or get in touch with what they feel is missing from their lives. Role-playing games as a commercial enterprise is generally considered to have started in 1970s with the first version of Dungeons & Dragons, created by E. Gary Gygax and David Arneson, and Dungeons & Dragons has remained the most popular role-playing game. It is a fantasy game in which the player characters are usually a group of wandering adventurers whose role is to explore catacombs and wildernesses where they use magic and skill at arms to slay armies of monsters and steal their treasure. Though the game generally tries to invoke a primarily medieval Europe ambiance, it draws inspiration from virtually every kind of mythology and form of fantasy fiction, including some with aboriginal overtones. Over the years, Dungeons & Dragons has published various books that collected the mythologies from numerous cultures for use in their game, and these have often included an “American Indian Mythos” as well that would include figures taken from numerous aboriginal mythologies. The use of the aboriginal elements has often been generic and little researched. One rulebook, Legends & Lore, explicitly states that “there are many analogies between tribes, even those located on opposite ends of the continent…. We can use these analogies to draw rather broad and coarse generalizations that will allow us to create a unified and consistent pantheon where, in historical reality, one did not exist.” This produces a vague pantheon ruled by the “Great Spirit” with various deities possessing names such as “Sun,” Wind,” and “Fire,” and with various animal spirits such as “Raven” and “Snake.” The diverse aboriginal beliefs across of North America homogenized into a single generic pantheon. Ultimately, the most prominent use of aboriginal imagery in Dungeons & Dragons has been through the use of the shaman archetype. Shamanism, which is to say the practice of communing with spirits and sending one’s soul into a spirit realm, is a global phenomenon, and in fact the word itself derives from Siberia. However, as discussed previously in this article, in North America, shamanism is generally identified with the spiritual practices of North American aboriginals, and ever since the 1960s such imagery has been very potent for Euro-North Americans. The Player`s Handbook II, a supplement for the latest version of Dungeons & Dragons, says that if a player character is a shaman, “in a rite of passage or initiation, you pledged yourself to the spirits, to be their voice and hands in the world…. Their power flows through you, calling you to lead, to fight, and to triumph.” The idea of being intimately connected with mystical forces in such a way presents a sharp contrast to our impersonal, mechanistic modern world. It was some time back in the 1990s that I stumbled upon a Dungeons & Dragons book called simply Shaman. It gave detailed information for playing shamans in the game, their magic powers, their mystical tools, their philosophies and cosmology, as well as information on the various spirits that they could summon and get their powers from (spirits with such generic names “Ancestor Spirit,” “Animal Spirit,” “Primal Spirit,” and so forth). The role-playing games that I played with my brothers and friends were soon filled with enigmatic characters possessing names such as “Touches-the-Sky” and “Kilatchi Dawn-Sprinter.” These figures strode out of the forest, dressed in animal skins and with talismans hanging in their unkempt hair, offending the prissy sensibilities of the knights, wizards, and all the other “civilized” player characters that made-up the majority of the adventuring parties. These shamans were fun to play because they seemed so strange and counter-culture, existing outside of the normal “civilized” roles of the game, and more alien to my own society than the pseudo-medieval figures were. Furthermore, the shamans had a much more intimate and dynamic relationship with their source of power than the traditional Dungeons & Dragons clerics and wizards did, bargaining with spirits directly instead of spending quiet hours in prayer or arcane study. The shamans were unusual, enigmatic, exciting, and opened the door for the sort of melodramatic overacting that role-playing games bring-out in people. They were not taken very seriously, but then nothing in Dungeons & Dragons is. It’s just there for cathartic, heroic fun. Though role-playing games try to be egalitarian, at least in North America, the people who play role-playing games are “predominately white, well-educated, middle-class males in their late teens to late twenties.” Though more women play role-playing games than they used to, the amount of non-Caucasian gamers is still relatively small. Vancouver is a multicultural city, and yet in all my years of playing role-playing games with numerous groups of people, most of the participants have been of European descent with only a small amount being of another ethnicity, and none of them aboriginal. Most role-playing game designers are European or Euro-North Americans as well. Despite, or more likely because of that, numerous role-playing games cater to the players taking on the identities of members of persecuted non-white cultures fighting against Western hegemony, a result of the increased dissatisfaction among many Euro-North Americans towards their own culture, and the desire to escape from it. Shadowrun is a role-playing game that uses aboriginals as sharp contrast to its world’s dominant culture. It is a science fiction game set in the middle of the 21st-century, inspired by the cyberpunk writing of William Gibson and similar authors while also adding the idea that magic has returned to the world, presenting an environment in which sorcerers, trolls, elves, and dragons all rub shoulders with cyborgs, computer hackers, and cold-hearted CEOs. Because of the presence of magic, many aboriginal shamans in Shadowrun became incredibly powerful and were able to lead their people in rebellion against the North American governments and take back most of western North American with only a few “reservations” in which European-American communities are still allowed to exist (the largest being Seattle, the favoured location for Shadowrun games). Among the kinds of characters that players can chose from are members of the aboriginal tribes that now dominate most of North American in the Shadowrun world and shamans who are each devoted to a particular animal totem which is heavily influenced by aboriginal archetypes (Bear is a healer, Coyote a trickster, Raven a trickster and transformer, etc.). The tribes and shamans serve as a sharp contrast with the computer hackers, corporations, and cyborgs that serve as cyberpunk tropes. In the world of Shadowrun, most Euro-North Americans are under the thumb of greedy capitalist CEOs who want to pillage the environment to make a few bucks, while numerous people spend all their time jacked-into their computers or replace much of their bodies with cybernetic hardware that enhances their abilities while draining their soul (or “Essence” as it is called in the game). The game presents this as the dark product of Western civilization, while the tribes and their shamans provided an antidote: return to nature and embrace the magic there, which provides more power than machines do, and does not force you to sacrifice your Essence in the process. Though it does not generally deal with North American aboriginals, the role-playing game GURPS Voodoo the Shadow War still features a persecuted North American racial minority striking back against the oppressors. In this game, the players play practitioners of Voodoo, generally lower class blacks, the descendents of the African slaves brought over to the New World who practice their religion in the slums and ghettos of the Americas. Their main enemies are the Lodges, a secret society that is “the force behind the Inquisition, the Reformation, the Industrial revolution, and most major conflicts and events since before the fall of the Roman Empires. They sabotaged the Ghost Dance, the Boxer Rebellion, and every mystical attempt of magical cultures to fight-off European invaders. They have been the secret protectors of Western civilization for 1,000 years and the secret masters of the world for longer than that.” Thus the commonly white, middle-classed players adopt the roles of members of an oppressed culture, a culture that follows a more naturalistic and intimate form of spirituality than what is primarily practiced in the West, and through this powers, the players’ characters are able to strike a blow against the sins of the players’ own Western tradition. Still, perhaps the greatest example of a role-playing system that thematically places itself in opposition to modern Western society is White Wolf’s “World of Darkness,” This is a series of linked games set in the modern world, each one about playing a particular kind of supernatural creature (vampire, werewolf, ghost, etc.) that possesses its own separate culture that existing secretly alongside the human one. They include such games as Changeling the Dreaming, in which the characters are fairies trapped in human bodies who must fight against the increased banality of the modern world which does not believe in magic or dreams, and Mage the Ascension, where the player characters are members of the Traditions, practitioners of cultural magic who battle against the Technocracy, a cabal that wishes to purge the world of all sorcery save that produced by its own machines. As with Changeling, modern society in Mage is perceived as being overly materialistic, banal, and toxic, crushing the souls of its inhabitants because it cuts them off from magic and dreams. Among the Traditions, side-by-side with Zen martial artists and Celtic witches, are the Dreamspeakers, mages who specialize in spirit magic and come from numerous tribal cultures; their symbol is a stylized bird in a manner similar to the carvings of the Haida and other aboriginal tribes of the Pacific Northwest Coast. Though both Changeling and Mage grant opportunities to “play Indian,” any aboriginal overtones are peripheral to the game. This is not the case with another World of Darkness role-playing game: Werewolf the Apocalypse. The premise of Werewolf is that werewolves, or the “Garou,” are the champions of Gaia, the Earth, and are fighting a losing battle against the forces of the Weaver, the embodiment of technology that wishes to enslave the world through machines and cities, and most especially the Wyrm, the embodiment of corruption and destruction that seeks to obliterate all existence, and uses pollution to ravage the Earth. The werewolves are divided into thirteen tribes that represent either philosophical stances (the Red Talons despise all technology while conversely the Glass Walkers believe that technology can be redeemed to serve Gaia) or cultural stereotypes (the Get of Fenris are bigoted berserkers of Nordic descent while the Fianna are Celtic poets and singers who have close contact with the fairies); two of the tribes, the Wendigo and the Uktena, are American aboriginal. Both of these tribes embody a particular aboriginal stereotype: the raging warrior filled with rage towards the white man, and the mysterious shaman. Though the Wendigo contains elements of numerous aboriginal cultures, including a totem and name taken from the mythology of the Algonquians and their neighbours, in general behaviour, the Wendigo are most influenced by the Lakota, Dakota, and other tribes that fought in the Indian Wars. The Wendigo as a whole despise European society and especially the European werewolves for stealing their land and wiping-out many of their people, and believe that the invaders brought the Wyrm to their lands. While the Wendigo rage against the invaders, the Uktena are more willing to deal with them. Though originally purely Americans, now the Uktena mingle with the disenfranchised from all over the world; “they can be found meeting with aboriginal shamanic lodges in the wilds of Africa and Australia, as well as with hedge wizards and holy men among the poor blacks, Asian immigrants, and refugees in the United States.” The voice of disposed peoples all over the world, the Uktena are mighty shamans and keepers of secrets. The Wendigo and the Uktena together provide aboriginal stereotypes for players of the game to explore. 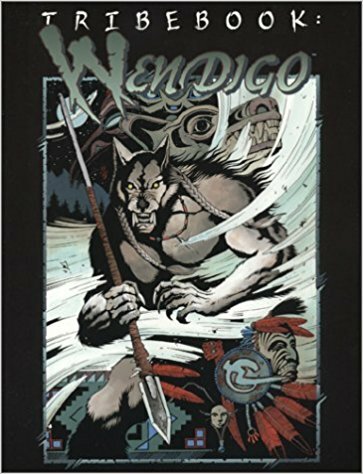 Though the Wendigo and the Uktena are the two specifically aboriginal tribes in Werewolf, even when choosing characters from other tribes, the player characters are still effectively playing Indian. Mark Rein-Hagen, the creator of Werewolf the Apocalypse, described his motivation to create the game as coming from his dissatisfaction with the modern world, which he found materialistic, cold, and antiseptic. He experimented with various religions to try and gain a mystical experience, but failed to achieve any divine connection. He didn’t want to live in a world “without meaning, without passion. I don’t want to live my life without spirituality…. I decided to create a spirituality for myself, practically from scratch. Through the medium of storytelling. Through my art. I call it Werewolf the Apocalypse.” In Werewolf, all the werewolves are the beloved of Gaia, the Earth, who fight against all elements of the modern world that Rein-Hagen dislikes, like the Indians descending on General Custer at the Little Big Horn. The 2nd edition Werewolf rulebook even begins with a quote from the Lakota mystic Black Elk: “if the vision was true and mighty, as I know, it is true and mighty yet.” Therefore, the game associates itself with the visions of Black Elk, who witnessed the massacre of Wounded Knee and who cried for the torment of his people. The game connects itself to Black Elk’s yearning for the old, tribal ways, for the purity of nature. Ultimately, the quote links the pain of Black Elk and aboriginals like him to the personal frustration of the people who play Werewolf and similar games. No matter whether someone in Werewolf plays a red power Wendigo or a soulfully Celtic Fianna, he is still “playing Indian” and “through Werewolf we vented our inner anger at not being able to affect our lives and losing our connection to the natural world.” Through Werewolf, the players express their frustration at the modern world and the sins of modern Western society, and seek to return to nature, to return to the spirits. Though role-playing games are usually played around a table, like they were board games but with no board, there is a variation that is especially popular with White Wolf’s World of Darkness. This is live-action role-playing (often called a “larp” for short). In a larp, the players dress-up in costumes and act-out their character’s actions, like improv acting with no audience. It was through a Werewolf the Apocalypse larp that I received my most intense role-playing experience. As mentioned at the beginning of the essay, for the really big Werewolf meetings in this larp, the players would all congregate together in a tipi where we’d spend the whole night as our characters, crouched around the campfire as we told stories of our adventures in the realm of spirits, of our battles against the forces of pollution, corruption, and technology, and of the visions our pack totems saw fit to grant us. This was a potent experience, but paled in comparison to the session when my character and his particular werewolf pack earned their totem. It was winter and our larp’s referee led us onto a snow-covered field just out of downtown, and told us that our characters had now entered the Umbra, the Spirit World, and were going a quest to get a totem for our particular werewolf pack. We went past piles of tires and other discarded objects; the Umbra looked like this field, this place, but interlaced with spirits: the spirits of the tires, the spirits of the snow, everything that was in the real world had a heightened, more mystical presence in the Spirit World. As we hunted for the totem, the whole pack joked and played around, for we were a circle of friends and allies that had formed under the will of Gaia, what werewolf society had instead of family units. Eventually we encountered what we were searching for, and despite some misunderstanding that resulted in some scratches, the Racoon totem chose us as its own. We were Racoon’s children and we felt welcomed by the spirits. None of the characters in my Werewolf pack were aboriginal, and my own character was in fact Nordic, an ethnicity not too far from my real one. That said, we were all still “playing Indian.” We rebelled against our existence in this modern world, against the lack of spirituality or closeness to nature, against the lack of camaraderie we felt from the general populace. We wanted to pretend that we were champions of the Earth, warriors dedicated to protecting Mother Nature from all her enemies. We wanted to walk the spirit realms, be immersed in that intimate spirituality, and to be part of a closely-knit tribe, a pack, a band of brothers… and the occasional sister, all joined together against the darkness. We wanted to become the noble savage, who seemed blessed with everything that was missing from our own lives. Everyone yearns for what he does not have and sees in others the things that are missing from his own life. This modern world has brought numerous marvels, but with those marvels comes pollution and artificiality, built upon the suffering of numerous people, include the aboriginal societies in whose land we now inhabit. Through powwows and secret societies and numerous other techniques, people have long tried to assume aboriginal roles to replace what they felt was absent in their own lives, and now role-playing games have served that purpose as well. In Dungeons & Dragons, I’ve put on the robes of a shaman, in Werewolf, I’ve worn the skin of a werewolf. My pack may have adopted the Racoon totem in Werewolf, but in truth the totem I was searching for was that of the aboriginal archetype, who is fighting for his land and the sanctity of his world, who is wise in the ways of the spirits and of nature. No matter if these role-players say their characters are following Raven or Bear, Coyote or Racoon, ultimately the aboriginal is the totem that anyone who is playing Indian is trying to take into himself. Martin Hackett, Fantasy Wargaming (Wellingborough: Patrick Stephens Limited, 1990), 41-47. Donald B. Smith, From the Land of Shadows, 215. Michael Nephew, “Playing with Identity” from Gaming as Culture, ed. J Patrick Williams, Sean Q. Hendricks, and W. Keith Winkler (Jefferson, USA: McFarland & Company, 2006), 127. Martin Hackett, Fantasy Wargaming, 23. James M. Ward and Troy Denning, Advanced Dungeons & Dragons 2nd Edition: Legends & Lore (Lake Geneva, USA: TSR, 1990), 15. Mircea Eliade, Shamanism: Archaic Techniques of Ecstasy, translated by Willard R. Trask (Princeton, USA: Princeton University Press, 1964). James Wyatt, Dungeons & Dragons 4th Edition: Player’s Handbook II (Renton, USA: Wizards of the Coast, 2009), 118. Kevin Hassall and Steve Miller, Advanced Dungeons & Dragons 2nd Edition: Shaman (Lake Geneva, Wisconsin: TSR, 1995). Tom Dowd, Shadowrun Second Edition (Chicago, USA: FASA, 1992). C. J. Carella, GURPS Voodoo the Shadow War, 11. Phil Brucato, Mage the Ascension 2nd Edition (Clarkson, USA: White Wolf, 1995),18. Mark Rein-Hagen, Robert Hatch, and Bill Bridges, Werewolf the Apocalypse 2nd Edition, 24-25. England: Oxford University Press, 1992), 344. Bill Bridges, Werewolf Player’s Guide, 91. Mark Rein-Hagen, “Spirit Quest” from Werewolf Player’s Guide, ed. Bill Bridges, 202. Black Elk, as quoted by Mark Rein-Hagen, Robert Hatch, and Bill Bridges, Werewolf the Apocalypse 2nd Edition, 2. Steve Herman, “Oh Boy! A Cat’s Eye Shooter!” from Changeling Players Guide, ed. Cynthia Summers (Clarkston, USA: White Wolf, 1996), 182. This entry was posted in Essay and tagged aboriginal, Dungeons & Dragons, GURPS, noble savage, role-playing, Shadowrun, World of Darkness. Bookmark the permalink.